An eye shadow kit with six sultry shades, a travel-size Eye Shader Brush, and a medium Pro-Prime Smudgeproof Eyeshadow Base. Captivating and compelling, this palette of six shimmering shadows shows off your sultry side. Created exclusively for Sephora, this sleek, travel-ready set also includes a mini Smudge Proof Eyeshadow Base and Eye Shader Brush. Included in this set are 6 x 0.03 oz Eye Shades in Alhambra, Bellisima, Kalahari, Galapagos, Coconut Grove, Night Clubbing; 0.09 oz Pro-Prime™ Smudge Proof Eyeshadow Base; and #3 Eyeshadow Brush. 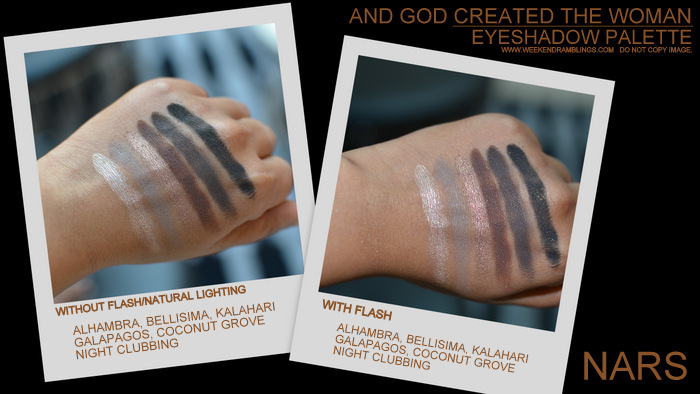 but on swatches, it's very subtle and picked up only under flash. 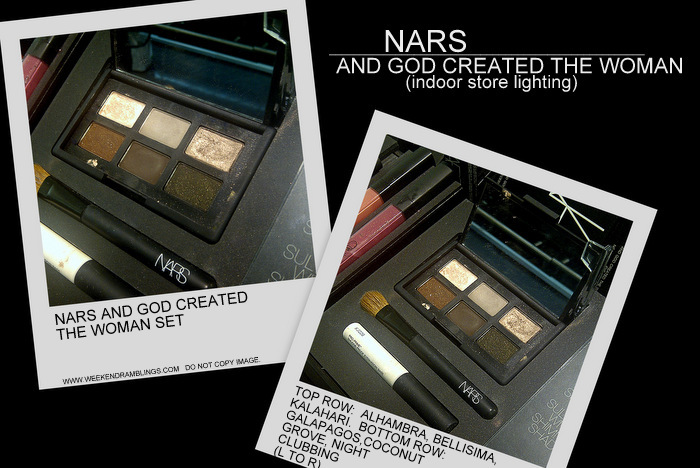 NARS And God Created The Woman Eyeshadow Palette would easily be one of my favorite palettes. It is very compact and features a thoughtful mix of very wearable colors, neutral yet not boring or too safe. Then there is the bonus of the primer and the brush. I do own a couple of NARS eye makeup brushes (love them) but don't have this flat one. I am quite torn between picking this palette up or just waiting and buying only one or two of the shades that I reeeeallly want. I already have NARS Coconut Grove single eyeshadow, but there's still 5 more I don't have :| And, it's all a size I can actually use in my lifetime and at a cost my wallet won't mind too much, especially if I can snag it on sale. Decisions...decisions...!! :D So, what do you think? Is this palette a yay or a nay? I just bought this - LOVE it!